Why should I undertake an MBA? This question is often asked on twitter #WhyMBA as people contemplate the decision to complete a Master of Business Administration (MBA). To help respond to this question, we carried out research on the current MBA students at Salford Business School to determine what was important to them. One of the greatest advantages of completing an MBA is the enhanced employability, 88% of Salford Business School graduates find a job or go onto higher study within 6 months of graduating according to the Destinations of Leavers from Higher Education (DLHE) survey. MBA graduates typically earn higher salaries then other graduates and enjoy an average salary of £96,661 according to the AMBA Careers and Salary Report 2014. One of the biggest advantages of completing an MBA is the enhancement of your employability, in particular at senior level in an organisation. Since the MBA degree is highly valued, having such a qualification opens up the job market, increases your chances of being invited to the interview and therefore provides greater career opportunities. An MBA program provides an array of enriched knowledge that better prepares graduates for higher level positions within the workplace. Students who complete their undergraduate degree and decide to do a MBA soon after will set themselves apart from their competitors, as they will have substantially upgraded their skill set. However, many MBA programmes are accredited by the global organisation that is Association of MBAs – AMBA – a global network of MBAs. AMBA opens doors to a select MBA community that has a range of networking events and training sessions that helps you to keep your high level knowledge to help you succeed in an executive position. This also applies to people who have a professional work history and decide to pursue an MBA later in life. They are able to refer to their experience and apply it into theory to produce real world examples and solutions. This enhanced knowledge can then be incorporated into their current and new business ventures. One of the great benefits of doing an MBA is the potential to expand professional networks. Being in an MBA program allows for regular interaction with like-minded students who wish to excel. In addition, students can also establish close connections with professors and other staff. Building such relationships is advantageous as it could aid with career progression. Essentially, possessing an MBA degree enhances personal brand equity. A person who accomplishes an MBA signifies that they are highly competent and well-prepared to take on many responsibilities within the workplace. An MBA graduate represents the ability to overcome challenges and persevere to achieve the best results. 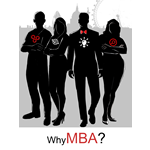 Why MBA at Salford Business School? Clearly a number of benefits of undertaking and MBA have been identified. The Salford MBA is delivered by the Times Higher Education (THE) Business School of the Year 2014 and the programme is accredited by AMBA. We believe that everyone has the capacity to unleash their inner superhero to not only reach their goals, but exceed them. 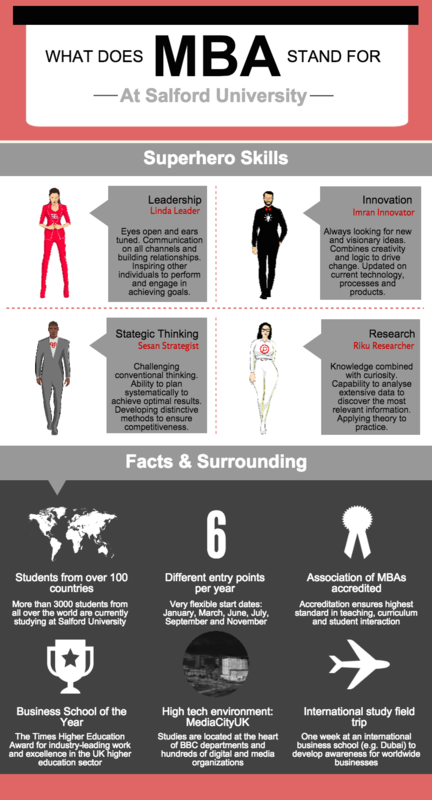 As you may have seen in the infographic above, we provide an answer to the question, what does MBA stand for? Under ‘Superhero Skills’, we have introduced an elite team called “The Experts” to depict what an MBA stands for at Salford University. This team consists of international members who possess a distinctive and important skill that can be found in an MBA student. At Salford University, students have the opportunity to harness their abilities and go above and beyond to not only achieve greatness, but be extraordinary. If you have what it takes to supercharge your skills and be the best you in the universe, then choose an MBA at Salford University.